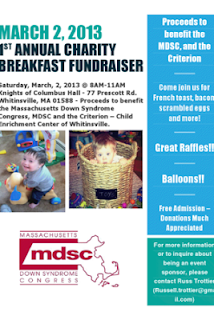 Down Syndrome Daily: MDSC Breakfast Fundraiser! One doesn't have to go to Disney to have breakfast with Minnie Mouse; she’ll be in one of the gift baskets raffled Saturday at a breakfast to benefit the Massachusetts Down Syndrome Congress and the Criterion Early Learning Center of Whitinsville. The breakfast will be from 8-11 a.m. at the Knights of Columbus Hall, 77 Prescott St., Whitinsville. The cost is a donation to a cause close to the hearts of Russ and Kelly Trottier of Sutton. Their son, Colin William, was born two years ago with Down syndrome, and since his birth the couple has learned just how crucial the two benefiting organizations are to families like theirs. Last year, Trottier raised money for the Down Syndrome Congress by running in the Boston Marathon. Unable to do that this year, he and his wife decided to sponsor a breakfast that they hope to make an annual event. In addition to the Minnie Mouse gift basket donated by the Shanahan family, items available in raffles include a Tom Brady autographed Red Game jersey from Reebok, a David Ortiz autographed baseball from Reebok and a Dion Branch 8x10 autographed photo from Pro Sports Chick. Those not interested in sports may be more interested in a tea and local honey gift basket donated by Ken Warchol, a “Thirty-One’’ gift basket donated by Ashley Tevapaugh, a custom portrait session for up to four, including an 8 X 10 print valued at $195 donated by Erica Ewing, or a 12-month gym membership from Blackstone Valley Physical Therapy. The organizations that will benefit from the breakfast play a vital role in Colin’s development, Trottier said. “There are a number of other families in the area who need our help and would greatly appreciate support,” he said. The Down Syndrome Congress and the Early Learning Center support and enable children and adults to be a part of the everyday life of their communities, Trottier said. “Any donation, however modest, will go a long way in helping our family and friends with developmental disabilities to be active members of the Blackstone Valley community,” Trottier said. For more information, contact Trottier at russell.trottier@gmail.com or 617-780-1927.